The reopening of The Dome will be delayed until January to accommodate the installation of new turf on its two playing fields, the chief operating officer of the Anchorage sports facility said Thursday. 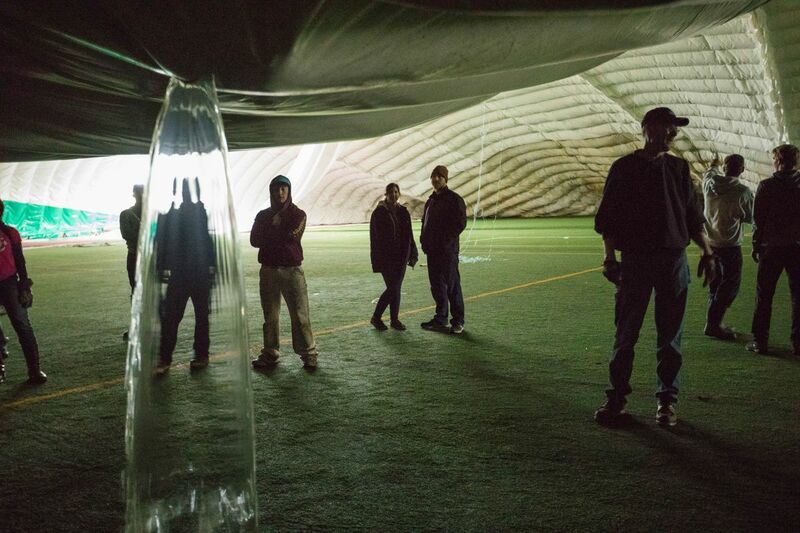 The synthetic turf covering the soccer and football fields was damaged beyond repair when the inflatable sports facility collapsed last January, Dome CEO Curtis Penney said. Contributing to the delay was the discovery of mold after the The Dome was re-inflated in September, Penney said. 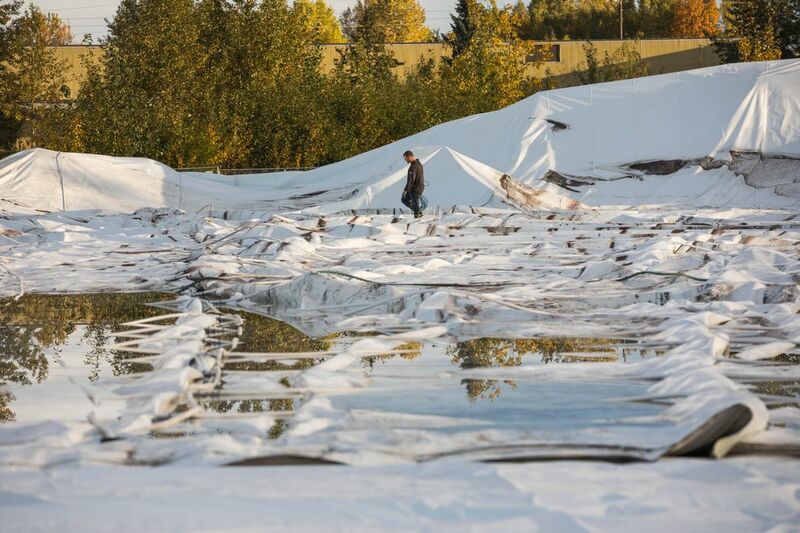 "We are working with an industrial hygienist to fix it before we reopen," he said. The Dome had been expected to reopen this month. "I'm a little bummed it's not going to be opened till January, but I understand why. Field turf is complicated thing," said Michael Friess, the coach of UAA's track and cross-country teams and a member of The Dome's board of directors. "… They're going as fast as they can possibly go," he said. "Everybody knows how important that facility is to the community." Thousands of people trained and competed at the 200,000-square-foot, air-supported facility before it collapsed under heavy snow on Jan. 21. The multi-purpose building includes a football field, a soccer field, a 400-meter track and batting cages. New turf — enough to cover 100,000 square feet — will cost $1.4 million, Penney said. It has already been ordered and is expected to be installed in December, he said. 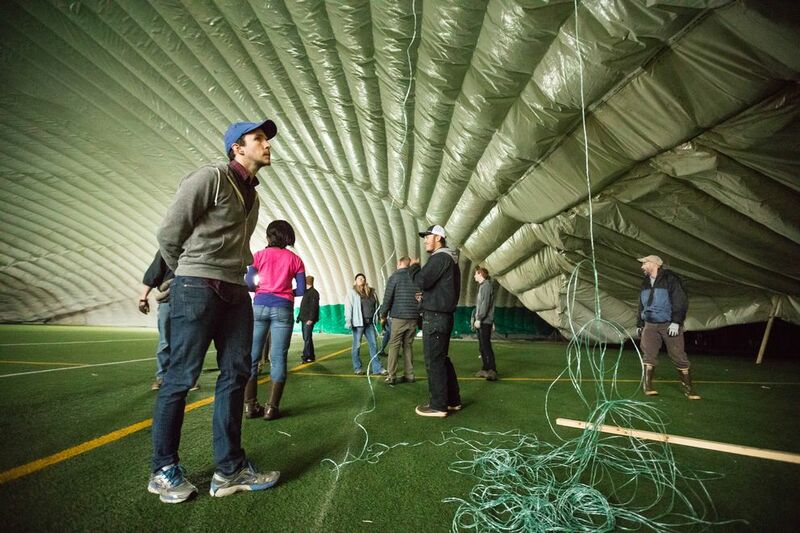 The condition of the old turf wasn't known until The Dome was reinflated in September. Once that happened, people were able to see what had been buried beneath the structure's polyvinyl fabric. "We have been doing a bunch of assessments inside to determine what needs to be repaired or replaced, and the turf experts have come back and said the turf is too damaged to be repaired," Penney said. "There's stains on it from the fabric resting on it and glass from the lights on the ceiling. Part of the tests made were a deep-cleaning of it, and they couldn't get up the stain." The deep-cleaning was able to get rid of the glass, but in the process it also got rid of some of the micro-rubber beads that are part of the turf's infill, Penney said. The cost of the new turf comes on top of the estimated $6 million needed to repair other damage and to settle the claims of bondholders, Penney said. In early September, Anchorage developer Jonathan Rubini – whose family was among The Dome's users – orchestrated a deal to finance the repairs of bondholders' claims. The new turf is an additional cost. Penney said he believes it will be covered by "a combination of insurance and Mr. Rubini himself." "But we're not sure yet," he said. "(Rubini) is being very gracious moving forward." Penney said a compensation plan is in the works for users who were unable to use their memberships because of the collapse. "We'll be announcing something before we open," he said. "We don't have all the resources in the world. Our focus is on those members but also on the turf — because without the turf, we don't reopen." Penney said there's daily activity at the facility. Construction crews are finishing some of the other necessary repairs, including the ongoing installation of a new, all-LED lighting system. "The biggest benefit people will notice when they come into The Dome is it's a brighter Dome," he said. The Dome, which opened in 2007, has a wide range of users – youth leagues, adult recreation leagues, the Anchorage School District and UAA, as well as individuals who run and walk on the track or take part in workout groups. Friess, whose track and cross-country teams have benefited greatly from the ability to train indoors during the winter, said he visited The Dome on Thursday for the first time in several weeks. "I walked in there today and my heart was lifted," he said. "I know how that sounds, but it was really cool. It's just wonderful to see it. "… My teams would certainly love it if it were open now, but it will be a wonderful New Year's present."